Offing major characters isn't anything new for television series, although it happens less often in popular sitcoms. 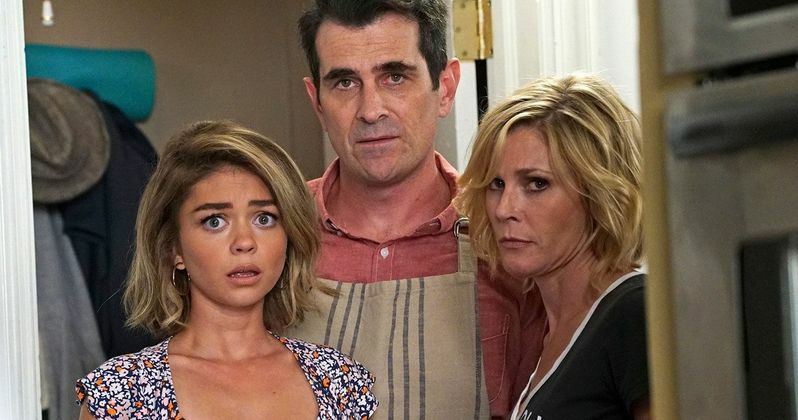 Compared to the overall tone of the show, it's going to feel like a gut punch when Modern Family writes out one of its characters in its upcoming season finale by way of killing them off. This news will certainly have viewers speculating to see which beloved character on the series we will have to say goodbye to, as really, it could be anyone. However, star Ariel Winter, who plays Alex Dunphy, is suggesting the person to go likely won't be who most of us are expecting. "It's a character that we'll all be sad to see go, but it's probably not an older character that you think is going to go. We haven't ever really had a death on the show. It definitely impacts the family, as I think it impacts any family. You know, some people have never dealt with death or if it's a person close to them, they're having to deal with them because it's a tragedy, and you follow people's stories on how they do that and I think some people obviously take it better than others." Naturally, many viewers may point to one of the older characters on the show to pass away, such as Ed O'Neill's Jay Pritchett. Winter's words are hinting otherwise, which is only going to fuel the fan speculation even more. Complicating matters even more is the fact that the series isn't yet renewed for an eleventh season, meaning the episode could also serve as the series finale. If true, literally anyone could be killed off, as the writers won't need to worry about where to go next for a potential season 11. As Ariel Winter says, the comedy series has never tackled a character death before, giving the Pritchett and Dunphy families an entirely new ordeal for them to handle. As each of the characters have very different personalities, they will all be responding in different ways, with the death hitting some harder than others. While the situation will be dealt with in a lighthearted way, it's bound to cause some sadness with the viewers, as everyone on the series is very entertaining in their own ways. Because we have no idea who will be biting the dust, we can only go by the hints given to us by the cast and crew. In addition to Winter's comments, co-creator Christopher Lloyd promises that the death will be "significant," suggesting it won't be a side character who most people aren't aware of. Still, it's very possible it could be a friend to the family rather than one of the actual Pritchett or Dunphy family members, such as Cam and Mitchell's friend Pepper or Hayley's boyfriend Dylan. In any case, we're not going to find out the identity of the deceased until the episode airs. Watch the show when it airs Wednesday nights on ABC to find out. Let's keep our fingers crossed it won't be one of our most favorite characters. This information comes to us from CinemaBlend.